What does League of Legends and Destiny have in common? If you said, absolutely nothing, you would have been right, until last week. With the release of Battleborn, the subgenres that once divided shooters have been colorfully thrown together, with surprisingly entertaining results. Released by the team behind Borderlands, Battleborn offers the same excited, wacky shooter mechanics that helped make it so memorable. It offers the same style as well, with unashamedly bright locations and characters that really pop in a humorous, less than serious game world. And learning and recognizing the characters is what really makes Battleborn stand out as a game. Obviously inspired by MOBAs, this hero shooter offers 25 complimentary characters with unique weapons, play styles and skills to learn and master. Amazingly, each character does feel completely different from the others, in both appearance and style, which makes for a lot of variety. You’ll have the chance to play as everything from a healer mushroom lady, dwarven axe wielding scientist and a penguin in a robot suit, as well as everything in between. But the problem with having such a wide selection of characters is the seemingly insurmountable learning curve on entry. Battleborn offers next to no help as you enter the fray, bar one unintuitive tutorial mission that teaches you little. Instead, you are forced to just experiment online to start developing your skills, which can be a little overwhelming. The effort is more than worth it though, as once you’ve found a foothold, the game will open itself up effortlessly and reveal how much fun it can be. If you can find a character you like, or even a game mode you understand, everything else becomes a little easier. For instance, I truly struggled to grasp the wider game initially, but once I started playing as a healer I found myself being useful to the team and learning the needed strategies that help me move into combat more effectively. 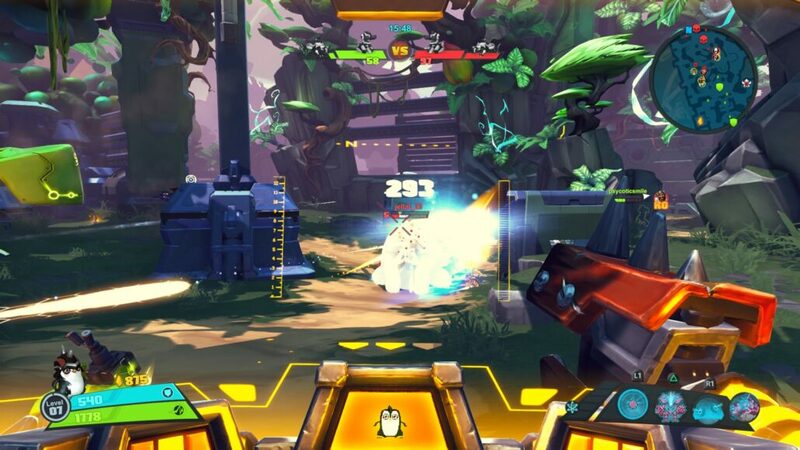 Combat itself can be a little troubling too, as conflict in Battleborn can feel messy and inaccurate. With up to ten players all unloading various bullets and abilities into the fray, you more often than not have no idea what is happening or who is killing you. The first person perspective doesn’t help either. Without a larger overview you’re left with only what is happening directly in front of you, which sometimes isn’t enough. 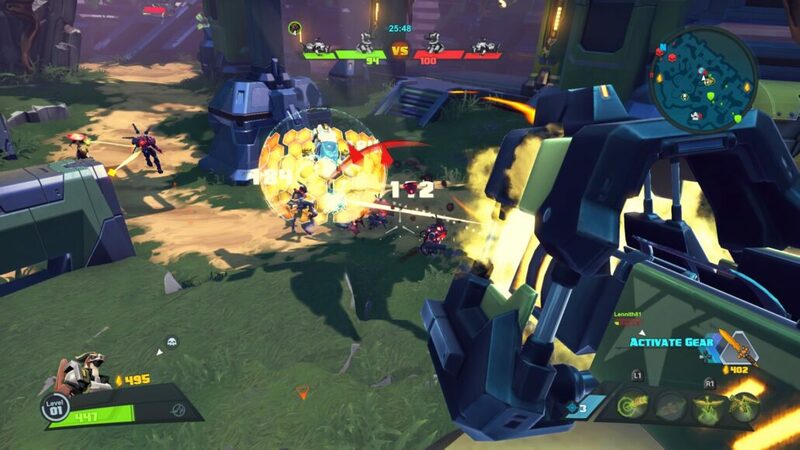 But with more practice and a favorite character or two you can start to make heads and tails out of the abundance of explosions that is conflict in Battleborn. 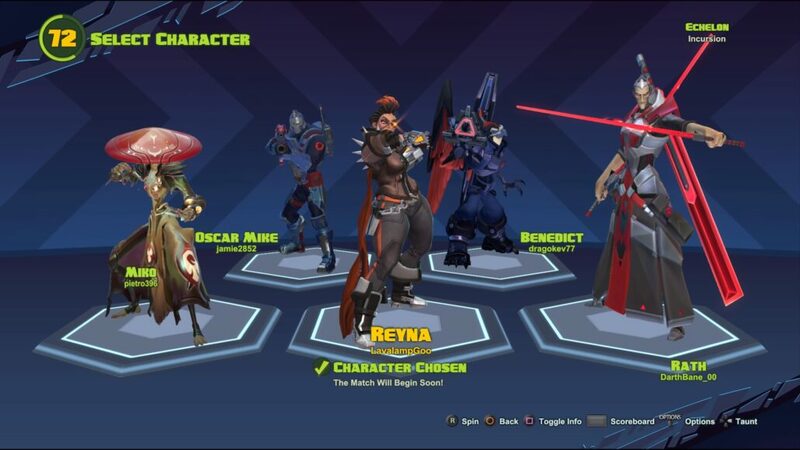 Finding a character is extremely important in Battleborn, and with so much diversity you’ll have to learn what works for you. The game breaks down each character in various little groups to try and help the player find similar playstyles easier, but experimentation is very important. I cannot handle the fast paced action of close quarter fighters, and prefer the steady distance of support classes, but everyone has their own preference. What is good that even support classes still have capable weapons and can feel like you’re helping with buffs and damage when needed. Unlocking all these characters is a little different to what you would expect. While there is a leveling system familiar to most online shooters, most characters have an alternate unlocking condition. These are challenges for various things, such as completing a campaign mission, playing as a certain character, or beating a certain multiplayer mode. This means you can work towards a particular unlock if you spot an interesting character you’d like to try. The only problem is when it comes to the campaign. Battleborn comes with three competitive modes, each with two maps, and eight campaign missions. These missions are designed to play in coop and are extremely grueling when attempted solo. Unfortunately, playing the missions online means you don’t get to select the map you play. Instead, the game chooses three and asks the players to vote. This means unlocking your favorite character comes down to hoping the game, and your teammates want to unlock it too. These aren’t the worst parts, and you’ll undoubtedly have other characters you want to play as well. What is really surprising is just how much you’ll enjoy Battleborn. The competitive games can take around half an hour to complete, but they continued to feel fresh and exciting throughout for me. In fact, you’ll probably be starting another as soon as you’ve finished the first. Even though there are not many maps compared to other online shooters like Call of Duty or Battlefield, Battleborn is an entirely different title where the variety of maps is much less important than the characters and players within them. Battleborn is a great game. It has some minor issues and can seem overwhelming to start with, but behind that is a really fun, really intuitive shooter that offers more depth than you’d expect from the wacky graphics and humor. An understanding of MOBAs is not needed to enjoy this game, and is a great entry into the genre for those of us who never managed before now. Like every other team game, playing with friends will always give you a strong advantage of a team of haphazard strangers, but playing alone doesn’t detract from the fun. Despite its advertising, the only worry with Battleborn is that it is a title that might be forgotten. It has done nothing wrong and is truly enjoyable, but against the upcoming Overwatch, Battleborn might find itself disappearing from the frontlines sooner than it should. If you've ever wondered what the fuss of MOBAs are, or wanted a little more shooter in your battle arena, Battleborn is perfect for you. It is so different from the competitive shooters on the market at the minute. Once you get through the initial trial and error, you won't look back at all.